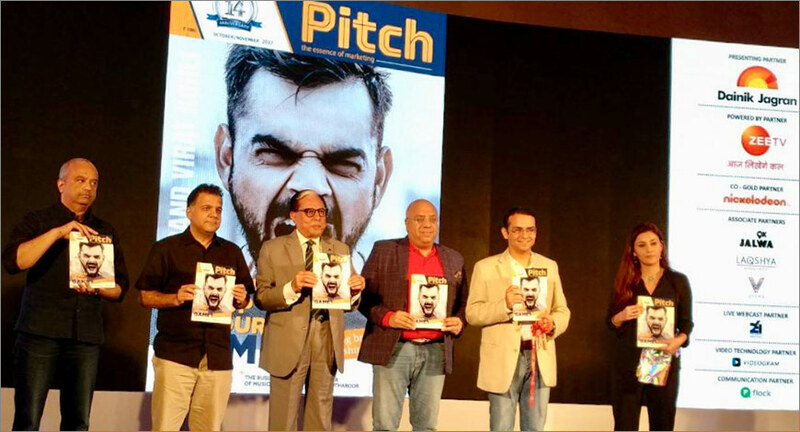 The 14th anniversary issue of PITCH magazine was unveiled at the 17th edition of the exchange4media Conclave in Mumbai on the 27th of October 2017. PITCH was launched in 2003, and over the years has become the quintessential marketing magazine. The magazine takes a close look at the evolving marketing, broadcasting and media paradigm. It provides incisive, in-depth reports, surveys, analyses and expert views on a variety of subjects. The current issue examines Relevance, Reliability and Resilience as the key qualities that are essential for brands to possess to thrive in today’s competitive landscape. A brand must resonate with its consumers, and the latest issue highlights key aspects every marketer must focus on to make his brand a success. In the current global environment, even fields such as politics, business, and economics require these attributes. Dr. Shashi Tharoor’s article on ‘Brand India’ encompasses all three attributes. Brand Virat Kohli is a prime example of ‘Relevance, Reliability and Resilience’. Bunty Sajdeh, the CEO of Cornerstone in his interview with PITCH talks about brand Virat Kohli. In this hyper-connected world, the rules of marketing are constantly evolving; the latest issue has columns by top marketers and industry leaders spotlighting these changes. They address the challenges and the opportunities of different facets of marketing and also bring into focus emerging trends in the field. They give sound advice that young marketers can benefit from. Given the way digital marketing is rapidly evolving and has become integral to every marketing campaign this issue has a special feature on AI (Artificial Intelligence) by leaders in the field. Features on ‘cinema advertising ‘, ‘the business of music’, and ‘festival marketing’ amongst others are also a part of the issue. The unveiling of the magazine was done by the Chief Guest of the conclave, Dr Subhash Chandra -Rajya Sabha member and Chairman Zee and Essel Group, CVL Srinivas - Country Head, WPP India and CEO (South Asia) of GroupM, Raj Nayak - COO, Viacom18, Annurag Batra- Chairman & Editor in Chief, exchange4media and BW Businessworld and Nawal Ahuja- Co Founder & Director, exchange4media Group. The conclave had eminent speakers and industry experts sharing insights on ‘Leveraging Open Innovation to Engage Consumers’, which was the theme of the event. The Keynote address was delivered by V. Vaidyanathan - Founder and Executive Chairman, Capital First Ltd, on the new challenges in the world of marketing in the light of the changing landscape. In addition, the ‘2017 exchange4media influencer of the year award’ was conferred upon CVL Srinivas - Country Head, WPP India and CEO (South Asia) of GroupM by the chief guest Dr Subhash Chandra -Rajya Sabha member and Chairman Zee and Essel Group and Raj Nayak - COO, Viacom18. The speakers included, Carter Murray - Worldwide CEO, FCB on ‘A Rising Tide: Why Diversity in Leadership Matters’. Vani Gupta Dandia -Marketing Director, Indian Snacks, Foods, PepsiCo India in conversation with Carter Murray on diversity and lack of it in leadership. Norm Johnston, Global CEO, FAST & Global Chief Digital Officer at Mindshare Worldwide on staying relevant in a hyper competitive media landscape. Shriranga Sudhakara - M.D & Founder, VYOMA Technologies Pvt Ltd. on building brand loyalty through social media and DOOH integration. Dr. A Velumani. Phd. - Chairman and MD, Thyrocare Technologies Ltd.
Chief guest, Dr Subhash Chandra -Rajya Sabha member and Chairman Zee and Essel Group on influencing the influencer. There were panels on ‘The Road Ahead & How Digital is Complimenting Print’, moderated by Anita Nayyar – CEO India & South Asia, Havas Media and ‘Sports Marketing’ moderated by Gaurav Kalra – Senior Editor, ESPN Cric Info.